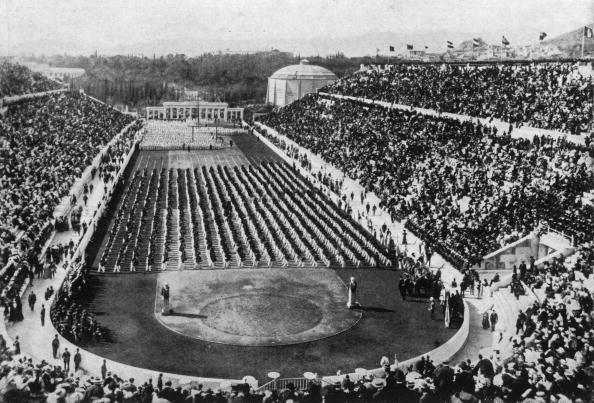 On 6 April 1896, 118 years ago today, the 1st Modern Olympic Games began in Athens, Greece. They would last for 10 days, until 15 April 1896, although in that era, Greece used the Julian Calendar, not the more modern Gregorian Calendar, so by their reckoning, the Games took place from 25 March to 3 April 1896. Here is a detailed summary of what happened, 118 years ago. Nations Making Their Summer Olympic Début: Australia, Austria, Bulgaria, Cyprus, Denmark, Egypt, France, Germany, Great Britain, Greece, Hungary, Italy, Sweden, Switzerland, United States (15). The Bid: Athens was selected as the host city for the Games of the Ist Olympiad of the Modern Era at the Sorbonne Congress in Paris on 24 June 1894. London and Paris were also given consideration as hosts, but Athens was elected by acclamation. 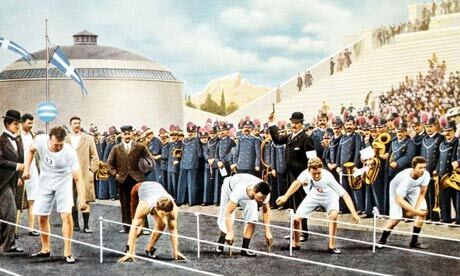 Games Summary: The obvious choice for the first modern Olympics was Greece and the 1896 Olympics were awarded to Athens at the end of the 1894 Sorbonne Congress at which Pierre de Coubertin convinced the delegates to reestablish the Olympic Games. The city of Athens embraced the Games, but the politicians were initially ambivalent, and in fact, in some correspondence reveals that they asked to be relieved of their duty to host. Only through the efforts of Coubertin and IOC President Dimitrios Vikelas, were the politicians convinced to lend their support to the project. Coubertin addressed a meeting of the Parnassus Literary Society, and finished by telling them, “We French have a proverb that says that the word `impossible’ is not in the French language. I have been told this morning that the word is Greek. I do not believe it.” Credit for saving the 1896 Olympic Games for Athens must go to Greek Crown Prince Konstantinos, who headed the Organizing Committee and lent his considerable prestige behind the Athens Games. And although money was short, a last minute donation of 920,000 drachmas by Georgios Averof allowed the ancient Panathenaic Stadium (built in 330 B.C.) to be refurbished and used for the Olympics. The Games themselves were far from the caliber of sport we expect today. Only 15 countries participated and many of the top athletes in the world did not compete, as the Games were not well advertised. The Modern Olympic Games began with an Opening Ceremony on 25 March 1896, or 6 April 1896, depending on whether or not one used the Julian Calendar (then used in Greece) or the more modern Gregorian Calendar, used by most of the world in 1896, and to this day. The first event of the modern Olympics was the first heat of the 100 metres, won by Frank Lane, a student at Princeton. But the first championship decided was that of the triple jump, won by James Connolly, a Harvard student, who left the Cambridge school to compete in the Olympics. He became the first known Olympic champion since Varasdates of Armenia had won the boxing in 369 A.D. The Americans dominated the athletics events, winning all but the 800 metres, 1,500 metres, and the marathon. The marathon was based on the legend of Pheidippides although the more likely spelling was Philippides. According to Herodotus, Philippides was sent to Sparta from Athens asking for help in the battle. After the battle, a runner, whose name was Pheidippides per Lucian and Eucles per Plutarch, was sent to Marathon from Athens to tell of the victory. Further details are sketchy, though modern legend has Pheidippides/Philippides arriving in Athens to tell of victory in the battle with the words, “Rejoice, we conquer,” and then dying from his effort. The legend is now felt to be apocryphal but it was the reason for the creation of the race from Marathon to Athens, a distance of about 25 miles. In the marathon, there were several early leaders, notably Edwin Flack of Australia, who had won the 800 and 1,500 metres. But midway through the race, Spiridon Loues, a Greek shepherd, took the lead and maintained it to the end. When he neared the stadium, messengers came into the ancient vestibule and cried out, “Hellene! Hellene! (A Greek! A Greek! ),” sending the crowd into a frenzy. The Olympic pride based on millennia of tradition was then realized by the home crowd, which heretofore had been rather disappointed by the results of the Greek athletes. Loues won the race and became a hero, offered gifts and riches by many different Greek merchants. But he asked only for a cart to help him carry his water and he returned to being a shepherd in his small town of Marousi. At the end of the 1896 Olympic Games, all the competitors and spectators, including the foreign arrivals, were unanimous in their praise of Athens as an Olympic host. 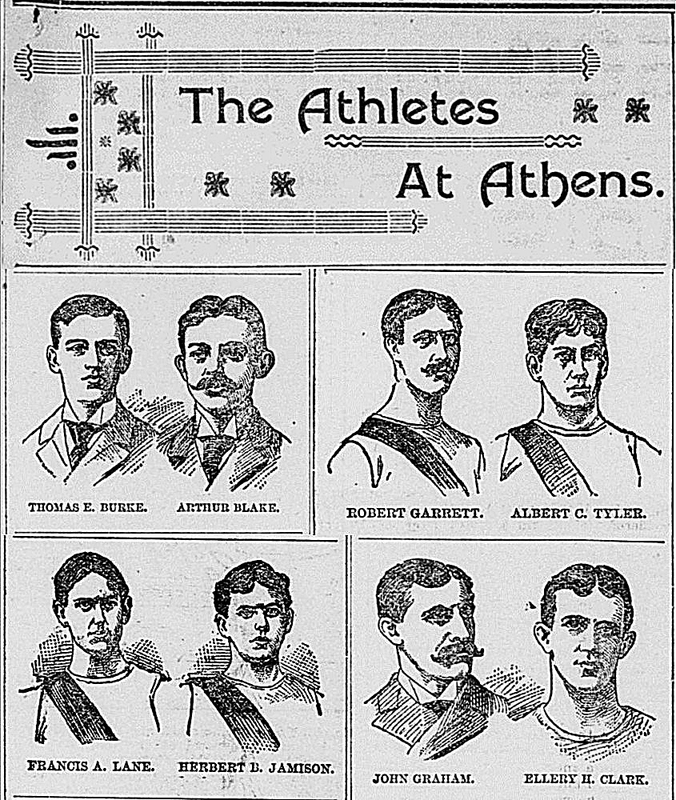 In particular, the American athletes thought that Athens should be the permanent site. 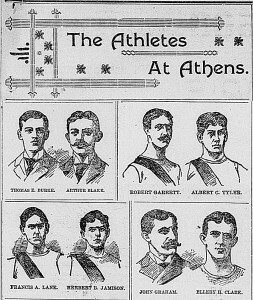 The team wrote a letter to Crown Prince Konstantine on 14 April 1896, which was published in The New York Times on 3 May, suggesting that all future Olympic Games be held in Athens. But it was not to be. Coubertin desired that the Olympic Games should be international in scope and rotate to various cities. He would always support that idea but perhaps the next two Olympics in 1900 and 1904 made him reconsider the idea a bit. *No second/no third in men’s gymnastics horizontal bar, teams; no third in men’s athletics 110 metre hurdles; no third in men’s cycling 100 kilometres; no third in men’s cycling 12-hour race; no third in men’s fencing foil, masters; no third in men’s gymnastics horizontal bar; no third in men’s gymnastics parallel bars; no third in men’s gymnastics pommelled horse; no third in men’s swimming 1,200 metre freestyle; no third in men’s swimming 100 metre freestyle; two thirds in men’s athletics 100 metres; two thirds in men’s athletics pole vault; two thirds in men’s tennis singles. †In 1896 men’s doubles tennis, Germany / Great Britain shared first place, Greece / Egypt shared second place, and Australia / Great Britain shared third place. The British player who won gold in singles and doubles tennis was John Pius Boland, who was technically Irish, but Ireland was at that time a part of the United Kingdom (Great Britain for Olympic purposes). Technically, in 1896, gold, silver, and bronze medals were not awarded as they are at later Olympic Games. In 1896, the winner received a silver medal, the runner-up a bronze medal, and there was no medal for third place, which is often not even mentioned in various results and descriptions of the events. However, as do many modern chroniclers of the Olympic Games, we term places 1-2-3 as winning gold, silver, bronze medals for consistency with more modern custom.